Christiana shows us her personal experience of the power of art therapy in the most appropriate way – through art. In the video, How Art Therapy Changed My Life provided by the Children’s Hospital of Colorado, Christiana describes her experience in art therapy as well as what she learned about herself by speaking while she draws. Christiana describes not feeling comfortable talking with professionals but she built trust with her art therapist by making art together. Christiana describes using a piece of clay to create a representation of the pressures she felt and then stabbed that clay with a tool. She found that she understood her struggles more by being about to visualize them as well as being able to take out her frustration on the clay. She even goes as far to say that the experience was fun! This illustrates the comfort that Christiana developed as she engaged more and more deeply in the process. Christiana found her own specific artistic interest of embellishing shoes and continues to use this as a therapeutic activity in her own time. 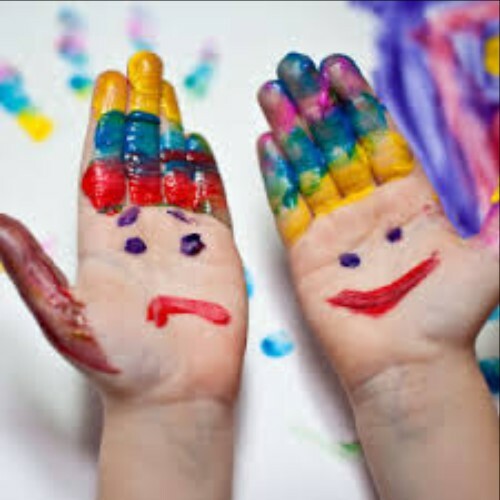 In Art Therapy with Adolescents, an article in the Western Journal of medicine, Shirley Riley writes, “The greatest difficulty for an adult seeking to establish a relationship with an adolescent is the teen's resistance to authority and lack of trust in the adult world.” Riley explains that this is a natural stage of development of adolescents as they move toward adulthood and seek more independence. This can explain the difficulty adults may have in gaining the trust of an adolescent. Art therapy gives an alternative to talking in therapy. There is space to work creatively and engage with an adolescent’s desire to express oneself. Art therapy involving the visual arts is likely the most well known type of Expressive Arts Therapy, but is not the only one. Adolescents can express themselves through music, acting, movement/dance, poetry, and more. Tonya White, an Expressive Arts Therapist at NESCA, is trained to use any modality of creative arts that an individual is drawn to. Sometimes an adolescent may have a preferred method of creativity, and sometimes the Expressive Arts Therapist will suggest a method because it will work well with the topic at hand. Both individual and group expressive arts therapy is now being offered for children, adolescents, and young adults at NESCA. Improvisational acting games offer fun and structured ways to interact and make connections with fellow group members. Every game is used to teach key social skills and build each member's self-awareness and self-esteem. Some games have a simple structure, such as mirroring one another's movements. Some games involve acting out scenes you might see in real life. In an atmosphere of having fun, we will celebrate as each member's social confidence grows! Mindfulness is the practice of engaging in the present moment with compassion and non-judgement. It is an approach that helps with regulating emotions and attention - especially for those who experience anxiety. Practical ways to bring mindfulness into your everyday life. Email Tonya White for more information or to sign up twhite@nesca-newton.com or fill out the intake form here.